If you’re looking to give the gift of time this season, why not head to Ernest Jones to purchase the Rebecca Minkoff Major Yellow Gold GRLPWR Strap Watch for £99? 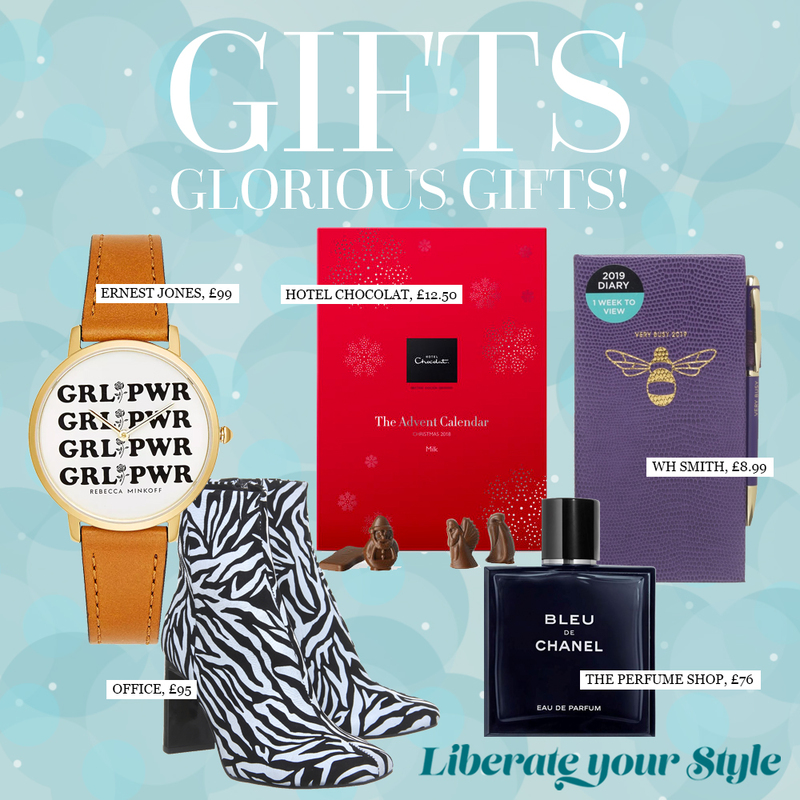 With a printed GRLPWR watch face, this is a great gift for a special lady in your life. As animal print takes the high street by storm, we can’t wait to grab the All Night Set Black Block Heel Boots in Zebra Printed Suede for only £95 from Office. These statement shoes are sure to have you standing out from the crowd and looking ahead of the trend when paired with a pair of skinny jeans. Chanel’s Bleu de Chanel parfum spray, £76 from The Perfume Shop is a real winner for a man in need of a treat. With notes of sandalwood, cedar and tonka beans, this makes for a perfect present. If you want to give an early Christmas present, The Milk Chocolate Advent Calendar from Hotel Chocolat is at a bargain price at only £12.50 and it gives a month of excitement. The countdown to Christmas Day can be filled with solid reindeers, snowmen, penguins and enchanted spruces with velvety-smooth milk chocolate! Also coming in dark chocolate, caramel and white chocolate, this is a sweet treat for all chocolate lovers. Get organised over the New Year with WHSmith’s Very Busy Bee Diary at £8.99. With a gold foil bee on the leather effect cover, the diary also comes with a gold pen that writes in black ink. We think this is the most stylish way to keep your plans in perfect shape! To share your gift ideas with us, head to our Facebook, Twitter or Instagram pages now.